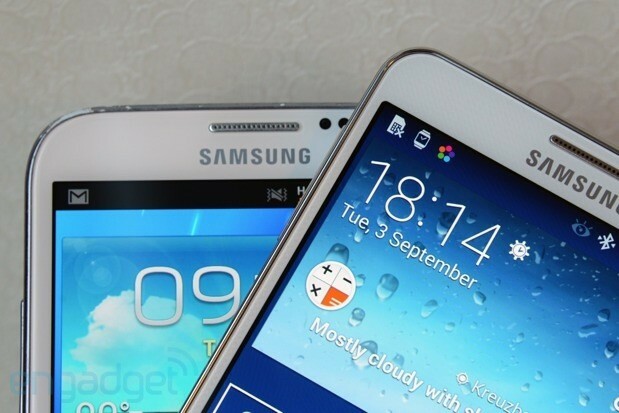 We had an opportunity to play with the black and white versions of the Note 3 here at IFA 2013 and while it was largely the same user experience we've grown accustomed to with previous Notes, Samsung still found a few clever ways to tweak both hardware and software to make it more appealing to consumers. Let's take a much closer look at the whole package after the break, but first enjoy a full gallery of images and a lengthy preview video that shows off many of the device's new offerings. A Note is a Note is a Note, right? For the most part, we'd say yes; we could easily tell from afar that the device in question was indeed a Note, just based on its overall design language. That doesn't mean the third iteration in the series is without a few design twists, however -- in fact, some areas of the phone's look and feel are a huge departure from Samsung's normal modus operandi. Before we dive into that, however, let's cruise through some of the basics: the new Note has a 5.7-inch 1080p Super AMOLED panel, giving the user roughly 386 ppi to work with -- plenty more than the first two Notes, which both pulled in less than 300. It's noticeably brighter than its predecessor and offers great views from almost any angle. Measuring 151.2 x 79.2 x 8.3mm, the Note 3 is 1.3mm narrower than the second Note (3.8mm narrower than the first), as well as 1.1mm thinner and 0.1mm taller. It weighs 168 grams, 12g lighter than its father. We continue to marvel at Samsung's ability to make phones with larger displays and yet trim down their overall size. The panel on the Note 3 is just a little taller, not wider; the company trimmed down the bezels on top and bottom to allow more room for this. Fortunately, it's not so much taller that it makes for an awkward hold -- frankly, it's even more comfortable to hold than the Note II, and as a result it may gain a few more converts who have long despised large smartphones. Make no mistake -- it's still large, but it's much more manageable than most supersized handsets on the market, including the first two Notes. 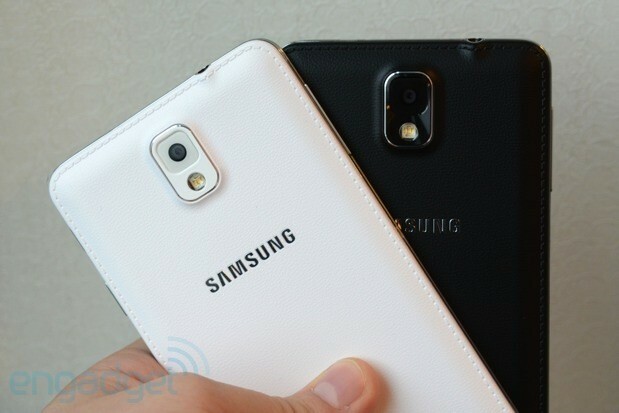 The biggest departures in Samsung's design are on the back and sides. The back cover (still removable) eschews the previous-gen's glossy plastic and replaces it with a matte leather finish, with stitching around the borders to complete the skeuomorphic fashion. It's more comfortable, offers a better grip and doesn't leave fingerprints. We'd like to think that this is Samsung's way of addressing our gripes about poor build quality, and in some ways it does help the Note 3 feel a little more solid, but we believe it would look better without the stitches. If you're not a fan of the back at all, there will be a wide assortment of different covers -- with various colors and a couple different build options -- that you can use instead. The sides almost look metallic from a distance, but let not appearances deceive you; they're plastic, and the longer you look at it, the cheaper it seems. There is a series of vertical ridges that run up the length of all four sides, which Samsung reps tell us is meant to mimic the look of a closed book (again, this seems awfully skeuomorphic). We'll wait until our full review to make a final judgement call on the overall build quality of the Note, but from what we can tell so far, it's better than the last model in some ways and worse in others. We have a full listing of specs of the Note 3 compared to the second-gen version, but here are the biggies. There will be two basic models: one with a 2.3GHz Snapdragon 800 chipset and one that uses a 1.9GHz Exynos Octa-core SoC. All of them will feature Android 4.3, a 13MP rear camera with Smart Stabilization, a 2MP front-facing shooter, 3GB RAM, your choice of 32 or 64GB internal storage, microSDXC support, IR LED, MHL 2.0, Bluetooth 4.0, WiFi 802.11a/b/g/n/ac and a 3,200mAh removable battery. LTE Cat4 support is also included (with up to six different band sets, depending on your region's needs), along with quadband DC-HSPA+ 42Mbps and quadband GSM / EDGE. By the way, the rear camera is capable of recording UHD resolution at 30fps and full HD at 60fps. Now, let's dive into the software side. With the Note 3, we didn't feel completely overwhelmed with a litany of new S-branded gimmicks features, but instead Samsung almost seems more focused on tweaking existing features and making the overall user experience a little nicer. The S-Pen is the area in which we saw the most changes, which makes sense given the fact that this is the Note's bread and butter. Pulling the pen out of its hiding place triggers a feature called Air Command, which is a semi-circular menu that pops up and gives you a few quick options: Action Memo, Scrapbook, Screen Write, S Finder and Pen Window. Action Memo lets you highlight a section of a note you've written and a menu of actions pops up underneath; if you write a phone number somewhere, the Note can recognize it's a number and give you the chance to call it directly from that app, for instance. The Scrapbook gives you the chance to do what all scrapbooks do -- collect information, categorize it and even save the metadata. Circle a product listed on Amazon, as an example, and everything found within your highlighted area gets added to the Scrapbook. This comes in especially handy when looking for something using S Finder, which is the Note's new search capability; it lets you search through handwritten notes on your phone, as well as websites, pictures, media and anything else you've saved. You can even filter the search down to popular trends, things you've accessed in the last seven days (you can change the filter criteria) and so on. It certainly has the potential to be a smart tool for power users. Pen Windows are the Note's new floating app icons. Select this option, draw a square or rectangle on the screen and you're presented with a list of different apps capable of hovering above the rest of the screen. You can easily move them around or maximize them -- a clever twist on this idea, however, is that you can minimize the apps and turn them into an icon that looks exactly like Facebook's Chat Heads. We really like this feature (and expect it to be even more useful when developers start coding for it), but it would be easier to use if we didn't have to go into Air Command -- which can also be accessed by hovering the pen over the home screen and pressing the button -- every time we want to add more Pen Windows. 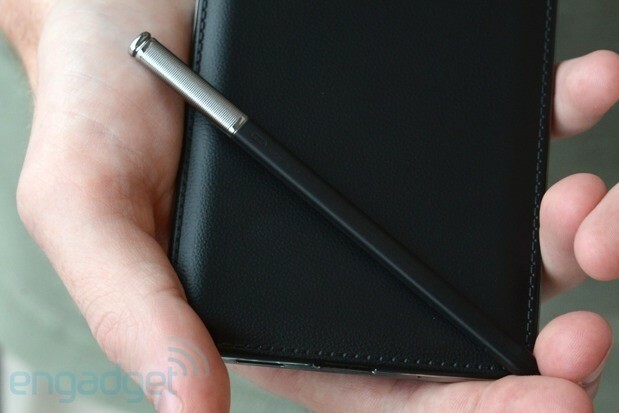 When playing with the Note, we noticed that the S-Pen was trickier to take out of its holster than it's been on any previous Note; the pen fits incredibly flush with the rest of the phone's chassis, and the only place to get a secure grip when pulling it out is a small protrusion at the very end. We'll make a disclaimer here by saying that this could easily change between now and the final production units, and perhaps it gets easier to pull out after regular use. As an aside: the Wacom digitizer is backwards-compatible with older S-Pens, though they won't actually fit in the holster. We're not sure if the functionality remains the same across the board, though we imagine it's pretty darn close. There are a couple of useful enhancements to Multi-Window as well; as you may recall, this was one of our favorite features introduced to the Note lineup last year. Samsung has now added the ability to run two instances of the same app -- in other words, you can have two different websites pulled up at the same time. (We'd love to see Samsung add a menu option which allows you to open linked URLs into the second window.) You can also save app combinations, so if you're constantly using Maps and Gmail together, just add that combo to your Multi-Window bar and it saves you from an extra step. Last but not least, the Note 3 also introduces a drag-and-drop function, which does exactly what it sounds like: drag pictures, maps and other items to the app running in the other window. This will be handy for sharing documents in emails and texts, for instance. Finally, Samsung hasn't stopped coming up with new ways to take advantage of its partnership with Flipboard. Swipe up from the bottom when you're in the home screen and you'll be taken to the Note's new Magazine UI. When we saw it, we were immediately reminded of the BlinkFeed feature on the HTC One, thanks to its use of Flipboard-like tiles and feeds, though this has a couple things to make it different. First, you can swipe between panels from left to right for different categories such as news, social and personal; there's also plenty of social media support, including Twitter, Facebook, Google+, Tumblr, Flickr and so on. Lastly, there's a button in the top right corner that, when pressed, brings up a vertical sidebar menu that contains the same apps that are currently in the docking port on your home screen. The Note 3 also has the Galaxy Gear App Manager, which we'll talk about in more detail in our hands-on. If you find yourself falling for the Gear, Samsung's first major foray into the wearables world, the Note 3 and 10.1 2014 edition are both compatible with it, since they both run on Android 4.3. Samsung reps tell us that we'll likely see the Gear become compatible with more Galaxy devices as they upgrade to the latest version of Android, but unfortunately it appears unlikely that there will be any support for non-Samsung phones or tablets. If you're looking forward to the Note 3, keep on the lookout for it to begin rolling out globally to 140 countries starting September 25th. We're not sure if this is the magic date the US carriers will start selling it as well, but we do know at this point that it's coming to AT&T, Verizon, T-Mobile, Sprint and US Cellular. We'll keep you posted as we hear more about pricing and availability. Berlin, Germany – September 4, 2013 – Samsung Electronics Co., Ltd. today introduced GALAXY Note 3, the latest update to the Note product line. The new Samsung GALAXY Note 3 adds delight to daily tasks and infuses innovative features that help consumers tell the story of their lives. Samsung GALAXY Note 3 delivers a larger and better screen for the best viewing experience and more powerful multitasking, and introduces significant S Pen improvements that make everyday life easier and faster. Samsung GALAXY Note 3 comes with a wider (5.7inch) full HD Super AMOLED display, yet slimmer (8.3mm) and lighter (168g) hardware design, and more powerful and longer lasting (3,200mAh) battery. Also, equipped with a 13 megapixel rear camera with Smart Stabilization and high CRI LED flash, Samsung GALAXY Note 3 enables users to crisply capture every visual story in their lives, even in low light and active situations. Samsung GALAXY Note 3 offers the latest LTE technologies – CAT4 Carrier Aggregation and supports the greatest number of multiple frequencies. Incorporating the industry's largest 3GB RAM, the GALAXY Note 3 also provides faster and more powerful performance. • With the new Multi Window, users can toggle seamlessly between applications without closing the window or opening a new page, allowing for enhanced productivity and collaboration across programs. Consumers can also run one application in two windows at the same time. For instance, users can read the news in one browser while conducting a web search in another, or send an instant message through ChatON to a friend while reading a message from another friend. An improvement to Group Play, video sharing, is now available. Originally introduced along with the GALAXY S4, Group Play allows users to play the same music, to play games together, and to share documents. It now enables consumers to share videos and play content together with their friends simultaneously. Users can also connect up to five devices alongside each other to create a "big screen" viewing experience. Simultaneously announced with Samsung GALAXY Note 3, GALAXY Gear is a new concept device that allows users to live life in the moment while staying connected. 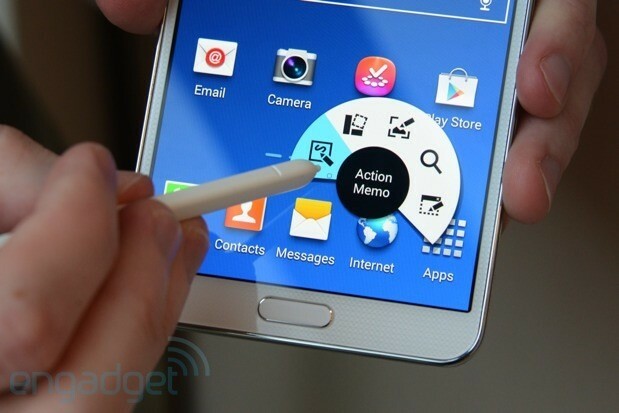 GALAXY Gear will notify users and give them quick previews of incoming texts, emails and more coming from GALAXY Note 3. 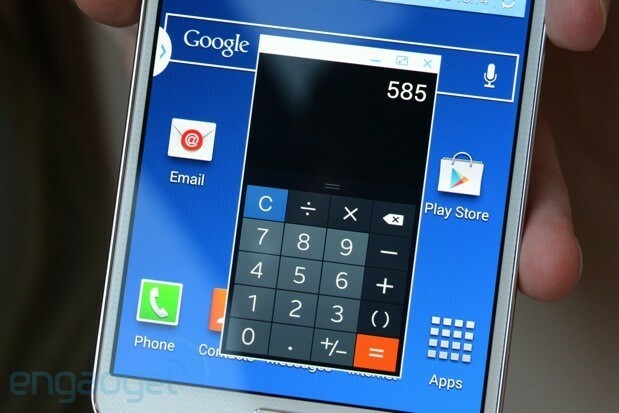 It will provide a range of other valuable features and commands that extend the GALAXY Note 3 experience. When an incoming message requires more than a quick glance, users can simply pick up their Samsung GALAXY devices and the Smart Relay feature will instantly reveal the full content on the screen. Together, GALAXY Note 3 and GALAXY Gear extend Samsung's efforts to provide users with the opportunity to design their lives, to express their passions and to make everyday life more easy and enjoyable. Zach Honig and Todd Thoenig contributed to this post.